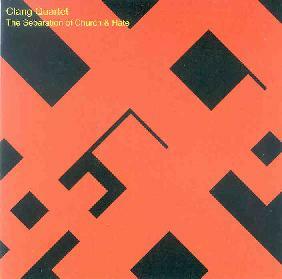 Clang Quartet - "The Separation Of Church & Hate"
Clang Quartet is the project name used by North Carolina drummer and sound artist Scotty Irving, who I'd first heard collaborating on one of Bret Hart's Duets series discs (he's also played with Eugene Chadbourne among others). On the Silbermedia web site Clang Quartet is described as "a performance-art piece based on the life of Christ". Irving's live performances are mostly improvisational percussion/performance-art shows ("based metaphorically on the life of Jesus Christ"), though on The Separation Of Church & Hate he uses all manner of object manipulation, electronics, guitar, and field recordings. Tracks like "Under God" showcase the variety of object manipulation heard across the album, and in this case it conjured up images in my mind of a sound-art take on the metal god guitar solo combined with an acid jam. Irving wrenches some cool sounds from whatever he's assaulting and the effect is harsh but not brain blistering, allowing the listening to tune in to everything that's happening. Along similar lines is "Companions", a combination of whimsical melody, scraping and scratching, and someone making loving cooing noises to their cat. Irving does a good job of blending aggression and atmospherics, and, once again, the listener is at all times able to dissect the layers and hear the variety of individual sounds. Among the other standout tracks is the cosmic noise freakout and chaotic carnival atmosphere of "The Winds And The Sea Obey Him". And on "Amazing Disgrace" Irving slowly builds a monster symphony, starting off with lo-fi dissonant acoustic guitar strumming, soon joined by dancey beats. Next comes electric guitar doing the same styled strum as the acoustic. Synths come in next, followed by a brain bashing noise assault, alien synths and power rock drumming. I really liked this one. Irving also reveals his views on Christianity with various samples. He attacks the racism and hypocrisy he sees in the church on the title track. "The Infidel Within" is a diatribe against Proctor and Gamble that has something to do with the company being associated with a satanic church. It could just be Irving's sense of humor but given the warped nature of religious groups I suspect these are from genuine television and/or radio shows. So we hear a string of these news reports backed by Irving's rock drumming and later some electronics. It's pretty wild and even hilarious at times, though it got a little old by the end of its 11 minute length. On "Hadephobia" we really get into quirky techno dancing, which also includes a discussion of the nature and existence of hell. And I laughed like.... errrrr... hell... when the track opened with the line, "Marines don't die, they just go to hell to regroup". A varied experience for sound-art, free-improv and noise-art fans that will require multiple listens for proper digestion. For more information you can visit the Silber Records web site at: http://www.silbermedia.com. Contact via snail mail c/o Silber Records; PO Box 18062; Raleigh, NC 27619.